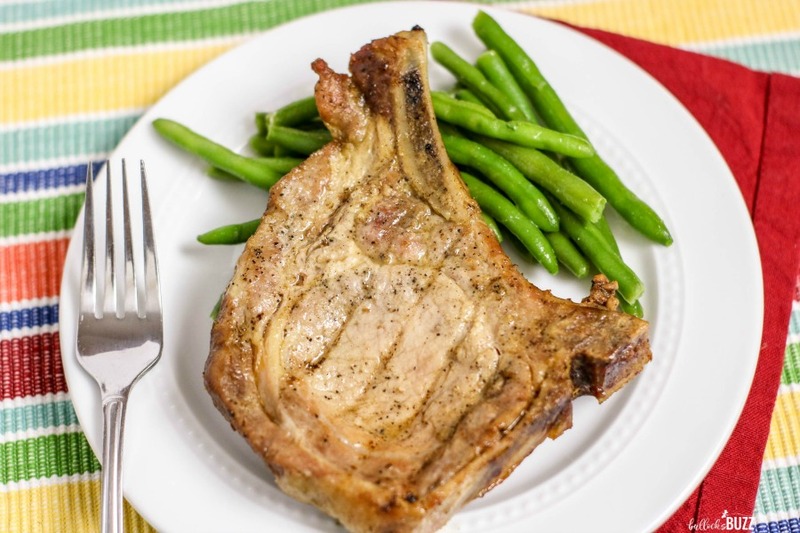 These tender and juicy grilled pork chops make for a perfect dinner any night of the week. 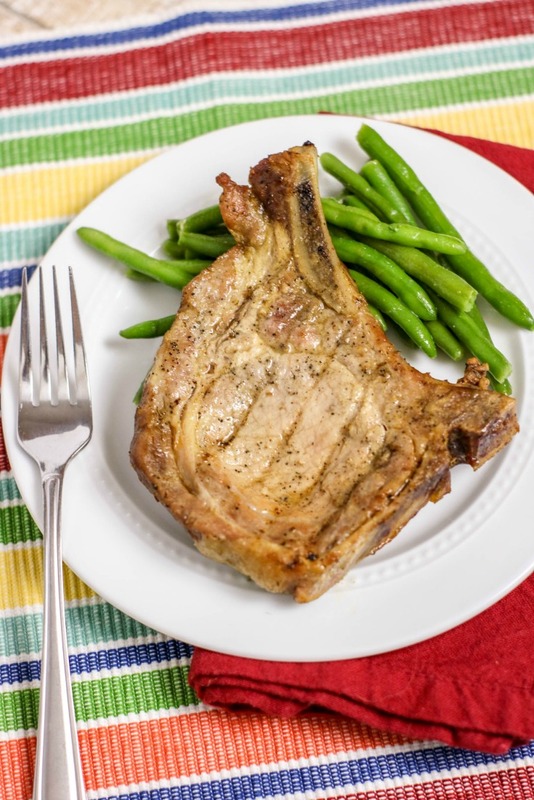 All you need is a few simple seasonings and a grill, and this savory grilled pork chops recipe is bound to become a favorite! Pork chops have always been one of my favorite cuts of meat. They’re easy to cook, incredible tasty, and you can often find them on sale in the store, which makes them a very economical choice for dinner. Plus pork chops are incredibly versatile. You can bake them, broil them or saute them. You can fry ’em — like these Southern Fried Pork Chops — or you can cook them sous vide. But one of my very favorite ways to cook them is to grill ’em! This simple Grilled Pork Chops recipe is one of the easiest and tastiest ways to grill pork chops. With just a few common ingredients and a grill, you can have savory grilled pork chops that are tender, juicy and absolutely delicious. Plus, you can easily have your vegetables cooking while you’re grilling the meat, and have a tasty and filling meal that’s ready in less than an hour. Not sure the best way to grill pork chops? Check out my few simple tips below the recipe and you’ll be an expert in no time! 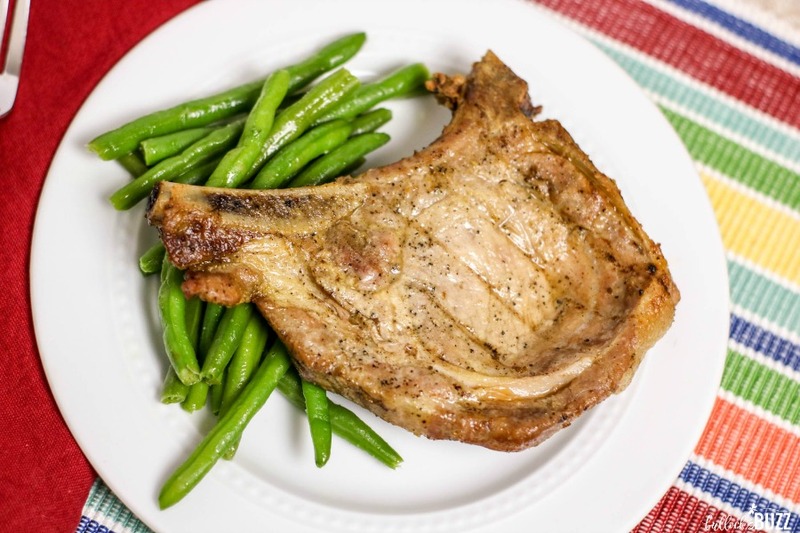 These juicy grilled pork chops are sure to become a family favorite! All you need is a few simple seasonings and a grill. This recipe serves 4. 1. To get started, in a small bowl, mix together the salt, pepper and paprika. 2. Next, drizzle the pork chops with olive oil on both sides, then sprinkle the dry rub mixture on each side of the pork chops and rub it in. 3. Now place the pork chops in a gallon-sized plastic bag, seal and let rest on the counter while you prepare the grill. If you want extra flavor, let them rest in the fridge anywhere from 1 hour to overnight. 4. Next, set up the grill with two zones: direct and indirect cooking, then heat the grill to approximately 500 degrees F.
5. Remove the pork chops from the bag and cook directly over heat for two minutes on each side. Then move the pork chops to indirect heat and continue to cook for about 15 to 20 minutes. Actual cooking time will depend on the heat of your grill and the thickness of your pork chop. Just remember that pork needs to reach an internal temperature of 145 degrees. 6. Remove the pork chops from grill and wrap them in aluminum foil. Allow to rest for 5 to 10 minutes before serving. In a small bowl, mix together the salt, pepper and paprika. Next, drizzle the pork chops with olive oil on both sides, then sprinkle the dry rub mixture on each side of the pork chop and rub it in. Place the pork chops in a gallon-sized plastic bag, seal and let rest on the counter while you prepare the grill. If you want extra flavor, let them rest in the fridge anywhere from 1 hour to overnight. Set up the grill with two zones: direct and indirect cooking, then heat the grill to approximately 500 degrees F.
Remove pork chops from bag and cook directly over heat for two minutes on each side. Then move the pork chops to indirect heat and continue to cook for about 15 to 20 minutes. Pork chops need to reach an internal temp. of 145 degrees F.
Remove pork chops from grill and wrap in aluminum foil. Allow to rest for 5 to 10 minutes before serving. *Calorie info via verywell fit Recipe Calorie and Nutrition Calculator. A grilled pork chop can either be the most tender and flavorful piece of meat you’ve ever eaten, or it can be one of the most dry and leathery pieces of meat you’ve ever tried to eat. Perfect Grilled Pork Chops are actually quite easy to make, you just need to know a few simple tips. Go for thick, not thin. Thinner pork chops are great for oven and stove top cooking like in this Rosemary Sage Pork Chops recipe, but they are not the best choice for grilling. They cook too fast on the grill, and end up tough and flavorless. For grilling, you should buy pork chops that are at least 3/4 to 1 inch thick as opposed to thinner ones. Bone-in center cut rib chops or loin chops are the best for grilling. Avoid too hot temperatures. Pork does not like high heat for long periods of time. If you put a chop directly over hot fire, you’ll end up with one tough piece of meat. Instead, set up your grill for direct and indirect grilling like mentioned in the recipe. This way you can put a quick sear on both sides, and then move the chop to the indirect-heat area for slower cooking. Brine it, baby! Although I skipped it in this particular recipe, brining pork chops, even for a short time, will help keep grilled pork chops juicy and tender. Just remember to pat the chops dry with paper towels before grilling so they sear, instead of steam, on the grill. HUNGRY FOR MORE? Subscribe to my newsletter and follow along on Facebook, Pinterest and Instagram for all of the latest updates! 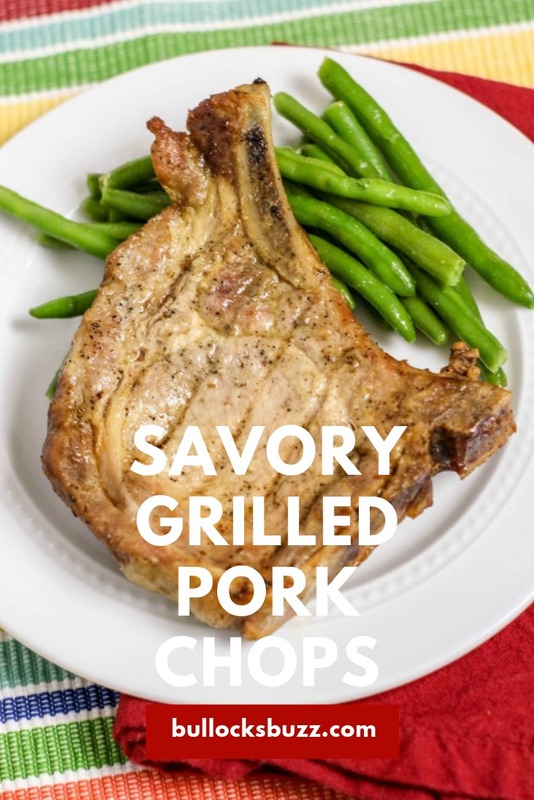 I hope you enjoy this simple grilled pork chops recipe as much as I did!  I’d love it if you’d share! Use the social sharing buttons below the post title to share with friends and family!